Engineering essentials for medical robotics. Citation: Sadique S. Engineering essentials for medical robotics. Case Rep Surg Invasive Proced. 2018;2(2):3-4. • Living-artificial interactive symbioses, e.g. brain-controlled devices or robots. In spite of some restrictive use of the term 'bionics' in popular culture, as well as the unfulfilled promises in the fields of neural networks, artificial intelligence, soft computing and other 'oversold' areas, it was agreed that the name bionics as defined above is the right one for the emergent technology also described as bio-inspired information technology (some people are suggesting info-bionics). There are numerous programs at several funding agencies which are supporting parts of this field under various other names [1-5]. It is important to know what Bionic is and how its open several new paths in the field of Medical Robotics and after this what are the essentials of Medical robots engineering with exhibiting two models. 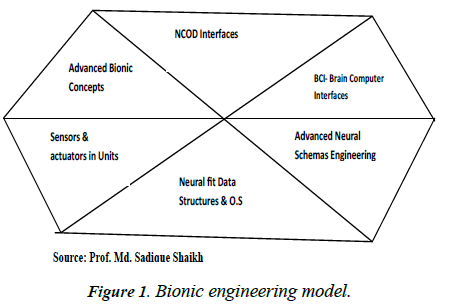 My first model is Bionic Engineering model divided into six engineering criteria are Advanced Bionic concepts, NCOD interfaces, BCI Interfaces, Advanced Neural Schemas engineering, Neural fit data structures and O.S and Sensors & Actuators with body mounts (Figure 1). The first domain based on generic brain biology, study of natural Intelligence (N.I), and how to convert into artificial using theory of neuroscience. Figure 1: Bionic engineering model. The second segment focuses attention how to engineer Neuron Command Operating Devices (NCOD) with ions-electrons communication to/from body to/from medical robotics, Cyborg and Bionic parts. The third criteria is all about how to interface all automatic medical assemblies and surgical robots with precise control, precision, coordinates, movements, time, pressure and others parameters control with Human brain and Computer (Electronic Brain) coordination. The next assumption for engineering is how to design and develop effective and efficient neural schemas. For neural schemas we also need schemas mapped data structures and operating system to handle overall medical process using bionic and best fit data structures develop. To command and control all input sensors, transducers, probes and output actuators, motors and diaphragms must need to design according to NCOD. This is second important model labeled as Medical Robotics Engineering model. The objective behind to construct this model is not to teach you medical robotics with complication, but to show you how in simple way you can plan to engineer complicated medical robotics systems very easy manner. This model consists 6 segments. The segment 1 is deal with Sensors, Probes, Diaphragms and Transducers engineering for diagnosis and work for its design and development rigorously. The second chamber deal with Ion-Electrons Communication and Exchange Engineering Where engineer must have to think very seriously how Biological-electronics Interfaces buildup for proper commanding and signaling. The third segment is patient examination program and the serious engineering here to detect diseases and likewise medical diagnosis. Further alternate given to Medical Program Unit for Diagnosis here alternate treatment can be design and programs possible. After disease detection, strategy for medical treatment using medical Robots design and develop at Action Plan Transfer Engineering. In last at the time of medical processing several sensors, actuators, probes, surgery tools, transducers work together hence accurate engineering need at stage six (Figure 2). Figure 2: Medical engineering essential model. I must say medical robotics is very vital subject to attempt and has lot of research opportunities which are not only in terms of advancement but also in terms of human welfare. I have discussed two model one for Bionic domain and another for how Medical Robotics can be engineer and implement. In the field also strong research candidates are “Cyborg” and “Bionic” along with regular research which opens several new paths. I really thankful to my wife Safeena Shaikh for her moral support my son Md. Nameer Shaikh for his love which keeps me fresh with new ideas and my close friend Tanvir Sayyed for her positive support with me. NSF/EC Understanding on co-operation in information technologies: Strategic Research Workshops IST-1999-12077. 2004;2:1. Md Sadique Shaikh. Analysis and modeling of Strong A.I to engineer BIONIC brain for humanoid robotics application in American Journal of Embedded System and Applications, Published by Science Publishing Group. 2013;1:2. Md Sadique Shaikh. Ultra-Artificial Intelligence (UAI): Redefing AI fir new research dimension in Advanced Robotics & Automation (ARA), OMICS International, London. 2000;6:2. Md Sadique Shaikh. Fundamental engineering for Brain-Computer Interfacing (BCI): Initiative for neuron-command operating devices in Computational Biology and Bioinformatics (CBB), SciencePG, USA. 2017;5:4. Md Sadique Shaikh. Defining ultra-artificial intelligence (UAI) implementation using bionic (biological-like-electronics) brain engineering insight. MOJ App Bio Biomech. 2018;2:127-28.